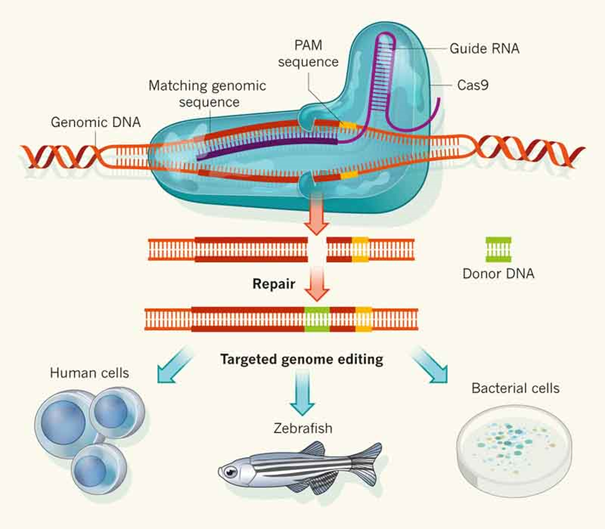 Recently, the engineering of genomes became a much easier task with the usage of a technology known as Clustered Regularly Interspaced Short Palindromic Repeats or CRISPR. In brief, CRISPR is derived from the homonymous prokaryotic immune system where it confers resistance against foreign DNA. Afterwards, it provides a kind of acquired immunity to prokaryotes. This system has been found in around 40% of all known bacteria and even 90% of all known archaea. Due to evolution, there are different CRISPR systems. Each system has a different protospacer adjacent motif (PAM). This motif is the only absolute requirement for CRISPR to work. The most often used system for genome editing in eukaryotes relies on the type II CRISPR system derived from Streptococcus pyogenes. All CRISPR systems consists practically of two elements: An RNA molecule providing the specifity to the target locus in the genome named guideRNA (gRNA). The name “guide” refers to its action to attract an enzyme called Cas9 to that site. Cas9 is the nuclease that cuts the DNA and thereby makes double strand brakes (DSB). Because DSBs are repaired by an error prone repair mechanism (Non-homologous end joining), the resulting repaired site shows insertions or deletions (indels). This faulty repair leads to a change in the reading frame or a premature stop signal. However, when providing a homologous template, DSBs can be repaired by homologous recombination. This allows the researcher to introduce mutations of his choice! In general, gRNAs can be designed to bind everywhere in any genome of any cell through Watson-Crick base pairing. As mentioned above, there is a requirement for a PAM that must be present at the target site. The described CRIPSR system has the PAM “NGG”. It has been shown, that the PAM NGA works as well. Thus, the gRNA can bind everywhere, where the bases GG or GA are. The gRNA itself does not contain the PAM, but has a size of 20 nucleotides, comparable to PCR primers. Gene regulation by using CRISPR activation (attraction of transcriptions factors) and CRISPR inhibition (usage of KRAB repressor). Tagging of genetic elements, reporters. For functional studies it is possible to have inducible CRISPR systems. Dynamic imaging of genomic loci in living cells (comparable to FISH, without the need of cell fixation). In which organisms? In all cells of all organisms. What is the service of the core facility? Guidance through the whole process beginning from design of gRNAs to the analysis of the successful gene edit. Discussion of the idea and how to achieve this on genomic level. Furthermore, the core facility can help in all kinds of transfections, independent from using CRISPR.